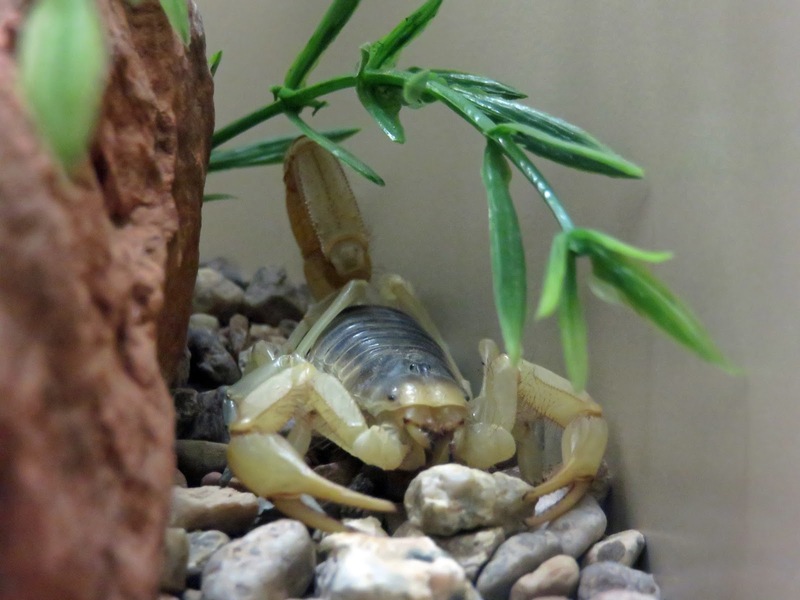 "Scorpions have changed little in the 350 to 400 million years since they first climbed from the primal seas and took their place among earth's first terrestrial anthropods." That's a reeaalllly long time to be terrifying everything around you. In the photo above is a picture of the Giant Hairy Scorpion we saw at the Arizona-Sonora Desert Museum. They have a scientific name, of course, but they're apparently not offended being called big and hairy. These are the largest scorpions to be found in North America. They range from 5.5 to 6 inches in length and are yellow-green in color. Supposedly, this species is docile and if you're crazy enough to want to collect them, this guy would be a good place to start. They become defensive if cornered or provoked, but other than that would likely run quickly from confrontation. I need to remember that. Although, as with all scorpions, this guy is nocturnal so I probably won't see him and if I do, I'll be dead from fright so it won't matter if he decides to nibble on me. Note to self: Install ultraviolet nightlights all over the house. 2015: Go Fly A Kite. No, Really.